Peter Fiduccia, aka The Deer Doctor, is a multi-talented communicator. He is a host, producer, book author, magazine writer, and seminar speaker. He holds a bachelor of science degree in Business Management from AIC in Springfield, Massachusetts. As a television personality, Peter has been the producer and host of the highly popular Woods N’ Editor-in-Chief of Bookspan’s Outdoorsman’s Edge book club for 10 years Water Big Game Adventures TV Series for over 30 years. The program airs throughout North America on several networks and is also seen on The Hunt Channel, and YouTube. Peter’s productions have captured dozens of awards and accolades including several distinguished Telly, CAPE, OWAA, and SIVA awards. He is also a seasoned video producer with a notable client list of credits including: The Outdoor Channel’s Circle of Honor series, Bookspan’s Outdoorsman’s Edge book club, Krause Publication’s Trapper magazine and the former Sports Afield Magazine. Peter also produced a pilot nature series for The Discovery Channel – Wildlife of North America. As a journalist, Peter is the former Consulting Editor of Whitetail Hunting Strategies magazine for 17 years, and the former Editor-in-Chief of Bookspan’s Outdoorsman’s Edge book club for 10 years. His articles have been published in Outdoor Life, Sports Afield, Field & Stream, Peterson’s Hunting, and numerous other outdoor publications. 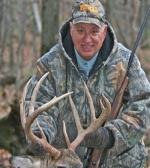 Peter authored the highly successful series of books, Whitetail Strategies Vol 1, Whitetail Strategies Vol. II, The Shooter’s Bible Guide to Whitetail Strategies, The Shooter's Bible Guide to Practical Food Plot Planting, and his latest release Whitetail Tactics. He has co-authored DIY Projects for Bowhunters, The Quotable Hunter, North America’s Greatest Whitetail Hunting Lodges and Outfitters, and The Little Red Book of Hunting Quotes. Peter also writes a syndicated outdoor newspaper column for Journal America and a monthly magazine column for Pennsylvania Deer Farmers Association. His journalism achievements include numerous Outdoor Writers Association of America Excellence-in-Craft awards. Promoters have referred to Peter as “a dynamic speaker” and his deer hunting seminars are exceptionally popular on the outdoor consumer sport show lecture circuit. He is regarded by his peers and audiences as an “authority” on hunting strategies for white-tailed deer. His seminars on using his Spider Syndrome Tactics and his extensive knowledge of the whitetail’s behavior, ecology and anatomy are highly attended because Peter skillfully combines his tactic information with an entertaining and humorous delivery. David R. Portney, author of the successful book, 129 More Seminar Speaking Success Tips, said of Peter, “Peter is a superb communicator.” Peter bonds with audiences not as a tutor, but as a peer. He is acknowledged by his peers, readers and viewers throughout North America as one of the nation’s top white-tailed deer gurus — an salutation he genuinely values and appreciates.